Kenya is a country of breathtaking beauty and contrast, from palm fringed coral beaches through open savannahs, lakes and deserts to the lush highlands, forests and snow covered volcanic mountains astride the Equator. Kenya is split by earth’s greatest chasm, the Rift Valley, offering some of the most fantastic views on earth. 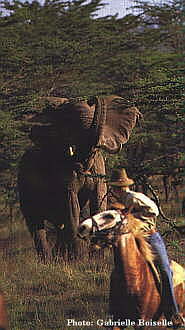 Hidden Trails have some pioneering horse riding safaris available in Kenya. These fantastic holidays combine excellent horse riding with some amazing safari and wildlife experiences, in the Masai Mara and Mount Kenya. On horseback you are on even terms with the wild game – what a thrill! These are the most unique and exciting safaris in East Africa. Our Aloe Blossom Ride pioneered saddle safaris in Masailand and remains the most experienced riding outfitter in the Masai Mara. You are driven out to the base camp and set off on horseback over some of the most dramatic wildlife and scenic country in Africa. The main party rides each day for 6 or 7 hours across country uninterrupted by fences, tarmac roads or even telegraph poles. You will be spellbound by the sense of space and freedom. Your sturdy surefooted Anglo-Arab and Somali ponies are tacked up with comfortable specially designed trekking saddles with saddlebags attached. The camp moves by truck along bush roads while you follow game trails across Masailand. Each afternoon you find your new camp set up beside a spring or waterhole beneath spreading acacia trees, in time for tea and hot showers before evening sundowners around the campfire. The ‘syces’ (grooms) attend to your horses on the picket line and provide special protection against predators. These safaris are only for the experienced horseman. Famous for its abundant wildlife and 1200 species of tropical and migratory birds, Kenya's game reserves are situated in some of the finest scenic country in Africa with Mt Kilimanjaro, Mt Kenya and Lake Turkana in the fabled Northern Frontier District forming the focal points of great fascination. Kenya's peoples are as varied and intriguing as its climate and terrain. There are more than 40 tribes most of whom retain their ancient traditions with their distinctive culture and authentic handicrafts. The nomadic pastoral tribes well away from cosmopolitan Nairobi are amongst the most colorful in Africa. These warrior tribes defied the Arab traders who journeyed the Indian Ocean in their ancient dhows to plunder the 'land of Zinj'. The climate in the highlands is exhilarating. The humid coastal lands give way to the dry desert heat before reaching the highlands at about 4000 ft above sea level where the crisp morning air, huge skies and cool breezes give the whole environment an ever more hypnotic atmosphere. We provide large heavy-duty canvas tents (100 sq ft floor space) with flysheets, camp furniture, beds, bedding, gas lights, showers and canvas ‘loos’ in traditional style. The dining tent or canvas awning is supplied with tables and chairs for gracious meals in camp. Meals are prepared by qualified African chefs and served up by well-trained stewards. Each safari is accompanied and managed by a professional ‘hunter’ guide. A nine-day exploration safari on horseback in the Masai Mara wilderness area. The Masai Mara Game Reserve and Greater Mara Conservancies represent most people’s idea of East Africa.